The Foundation sponsored a FreeBSD table in the expo hall that was staffed by Dru Lavigne, Warren Block, and me. Our purpose was to promote FreeBSD, and attract more users and contributors to the Project. We had a steady flow of people stopping by our table, asking inquisitive questions, and picking up some cool swag and FreeBSD handouts. Thanks to Dru and Warren staffing the table for most of the conference, I was able to spend most of my time talking to other open source leaders. This was a wonderful opportunity to find out, not only what they are working on, but also to have insightful discussions on issues we all encounter. I also received suggestions on conferences where we should have a FreeBSD presence. On my quest to learn more and contribute back to the Project, I participated in a few classes to fill my toolbox of knowledge. The first one was the Embedded Apprentice Linux Engineer Hands On Workshop. We learned about embedded systems by downloading and running Linux on the PocketBeagle. Many of you may not know this, but in a previous life I was a firmware engineer working on disk drives. It was fun getting my hands dirty again (not that I understood everything!). The second day I attended the all-day, Open Source Legal Training class. The class is meant for lawyers and law students, but a few other non-profit folks like myself, were allowed to attend. Some of the topics included Employment Contracts, Trademarks, Diversity, and Free Software Ethics. The presenters and panelists were all lawyers working in the open source world, coming from both large corporations like Microsoft and independent law firms. The information presented was helpful to me as we provide legal support for the Project, and I deal with legal issues running the Foundation. On Saturday, I participated in the Linux Installfest and Beginner Training. OK, I know you are thinking I’m a traitor for installing Ubuntu on my computer! However, if I’m going to advocate for FreeBSD and convince people to check out FreeBSD, I need to understand Linux too. Gaining this knowledge will help inform conversations on the advantages of FreeBSD – especially, when we’re asked things such as “What’s the difference between FreeBSD and Linux?,” or “How is FreeBSD better than Linux?” In addition, the Foundation has been wanting to offer FreeBSD classes, and I wanted to see how at least one beginning OS class was run. The installfest was frustrating because a few of us were having difficulty getting everything set up correctly to install and run Ubuntu. Part of this challenge was due to the fact that some of the other volunteers that were supposed to show up and help, were sick. So, I was secretly happy they didn’t show up! The documentation for us to follow, wasn’t easy to access, or well laid out. I appreciated the help from the two volunteers who were there. 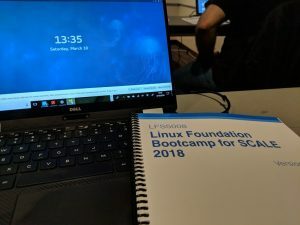 The content of the Linux Training material was helpful, and will provide a good template for creating our own FreeBSD Bootcamp type of workshop. I also talked to a few instructors about the possibility of creating FreeBSD curriculum and teaching some classes for us. The goal is to provide curriculum to anyone who is interested in running an Introduction to FreeBSD or FreeBSD Bootcamp type of workshop. Finally, the last day of the conference gave me a chance to sit down with people from other open source projects, and have some really thoughtful discussions. 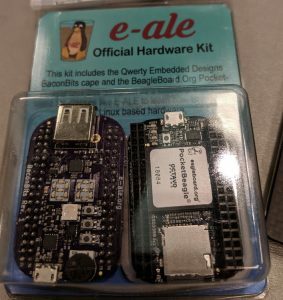 I have to say this was one of my most productive conferences for me, because I had a chance to attend and participate in some informative classes, and meet others from the open source community. Next year, we have the opportunity to have a BSD track, similar to the BSD Devroom at FOSDEM. We are looking for some volunteers in Southern California who can help organize this one or two-day event and help us educate more people about the BSDs. Let us know if you would like to help with this effort.